One of the more frequent points of confusion for those first beginning to explore the subject of atheism is the relationship of atheism to agnosticism. It is often thought that these represent two distinct positions on the question of god(s) and that one must be either an agnostic or an atheist. Among atheists, people who identify themselves as "agnostic" are sometimes even derided as people who don't have the guts to admit that they are atheists. Atheism and agnosticism refer to different questions. Atheism is indeed a response to the question of belief in god(s); agnosticism addresses the question of certainty. I recently ran across a great comment in reddit/atheism by a user called disturbd that provided a succinct yet accurate summary. I have edited it only for grammar. Agnosticism deals with one's claim to knowledge on a subject; atheism describes one's lack of belief in deities. They are not mutually exclusive terms. If you don't claim to know whether or not gods exist, regardless of your belief or lack thereof, you are agnostic. Agnostic simply means "without knowledge." 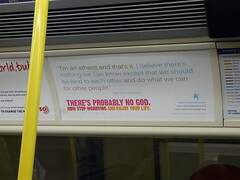 You can be an agnostic atheist (I don't know, but I don't believe in gods), or an agnostic theist (I don't know, but I do believe in god/s). A gnostic atheist/theist would claim to know their position is true. A gnostic theist holds the position, "I believe in god and I know he exists". A gnostic atheist is the opposite, "I know there is no god." The author goes on to explain that he, just like me, is an agnostic atheist. So to answer you question, I'm both. I'm an agnostic atheist. I just think the label "atheist" more closely describes my lack of belief. I find that many people that call themselves agnostic are actually atheists, but choose to label themselves agnostic to avoid the stigma associated with the word, and any consequential persecution from theists that may follow their "coming out." I look at it the other way. If I tell you I am an atheist, and you view me differently because of it, I would like to know that so I can move on with my life and pay you no mind.